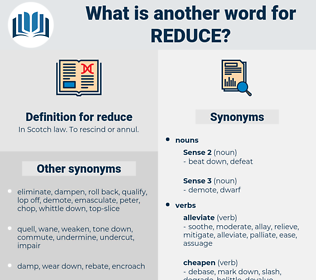 What is another word for reduce? In Scotch law. To rescind or annul. reduced, reducing, reduction, decreasing, lowering, decreased. reduced, reducing, reduction, slashes, decreases, decreasing, lowering, decreased. 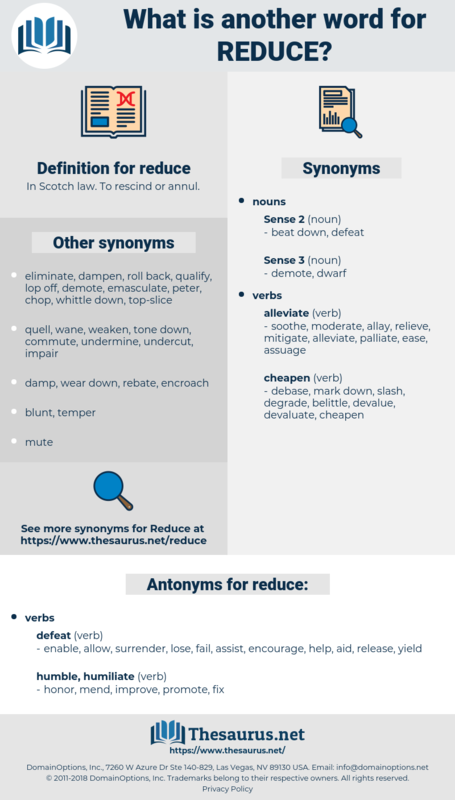 reduced, reducing, reduction, lessening, decreasing, shortening, lowering, diminution. diminished, de-escalate, minimizing, cut, downward. cutbacks, drags, minimize, Plays, minimizing, cut, cuts, restrict. Eliminated, minimised, received, Shrank, summarized, Dampened, closed, fell, Tugged, pulled, cut. curbed, Curtailed, Eliminated, alleviated, Declined, saved, shrunk, narrowed, dropped, dismantled, refined, confined, kept, cut. are, curtail, undermine, eliminate, weaken, erode, attenuate, cut, deplete, restrict. diminish, steps, lay, curtail, downsize, lighten, constrain, dampen, de-escalate, discourage, ameliorate, restrain, soften, detract, undermine, defuse, reverse, impair, de-emphasize, subtract, dwindle, save, belittle, relax, eliminate, weaken, counteract, suppress, dilute, circumscribe, streamline, halve, erode, attenuate, allay, slacken, rein, cushion, scorch, abridge, hamper, downplay, hinder, assuage, dismantle, stem, deter, cut, prune, simplify, diffuse, deplete, reabsorb, conserve, remedy, dispel, underestimate, restrict, deduce. enable, allow, surrender, lose, fail, assist, encourage, help, aid, release, yield. honor, mend, improve, promote, fix. stretch, extend, lengthen, win, strengthen, laud, enhance, grow, compliment, prolong, rise, raise, amplify, increase, upgrade, invigorate, enlarge, expand, develop, praise. complement, maximize, boost, up, compound, distend, overvalue, balloon, bloat, mark up, inflate, hire, advance, dignify, overestimate, swell, exalt, overprice, supplement, uplift, appreciate, overrate. He tried to reduce the very serious rebellion by promises, but there was too deep a hatred between the two churches. red dagga, retch, rhodes, redux, reddish, rhodesia, ruddy duck, rates, rattus, riotous, redox, road hog, radicchio, red ash, radix, ruttish, ratch, retick, rotc, roadhog, rat cheese, radish, rothko, radio chassis, roots, ready cash, red sea, roadhouse, reredos, road show, retouch, radius, ritz, rearwards, rutaceae, retake, ritzy, red oak, rodhos, rootage, ridge, roads. demean, take down, disgrace, put down, degrade. impoverish, replace, interchange, substitute, exchange. bump, kick downstairs, demote, relegate, break.